Summra, 11 years old, wrote a book with a title “Espionage Teens” as she was 10. The book is recently published. We want to thank Summra that she shared her story with Lissan readers. 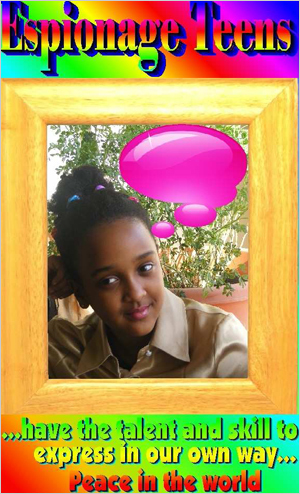 Above all, we want to encourage her to keep on following her dreams and her literary talent. I’m 11 years old student of Elizabeth Lane Elementary School in Charlotte, NC. I want to encourage children by staying at school and to start working on what they want to be. “The dictionary is one of the key ingredients of your knowledge”. I wrote a fiction book called, “Espionage Teens” when I was 10 years old and published in February 2011. “Like the fish’s bubbles in the water, ideas are popped up in the children’s mind”. I’m dedicating this book to those children who do have a talent and don’t get a chance like me and to put and share their ideas in their own way. To all readers, especially my friends (children of the world) who read this book: we have the talent and skill to express in our own way and share ideas and take charge of our future by avoiding drugs, alcohol and adult films and controlling the time we spend in video games. I wrote a book because I wanted children to know that no matter what you want to be, achieve your goal and don’t let people’s idea’s let you down but follow your dreams. LET’S KEEP IN TOUCH AND SHARE OUR IDEAS. to the Karanga of Zimbabwe and the Zimbabwean 31st Independence Anniversary Celebrations. To Christine Chambers also, for her guidance through the African School O.Y. P. A. accreditation process. It is time to remove my shoes again, to make the sacred journey. Drought is upon us, so I must go again to Matonjeni Shrine. I go to represent my people; to intercede for the Karanga. We are a group within the Shona. I go to plea for rain. I go without food or water. Ascending the hill, reverance controlling my every movement. I place my offerings, donated by the villagers. Then kneeling, facing away from the entrance of the cave. I ask the Creator, who we call Mwari, to remember us and bless us with rain. I am the messenger, titled Manyusa. I am the Ambassador of Rain. Because we dream of corn and yearn for sadza. We have been builders of state and empire. Great Zimbabwe, Mwenemutapa; the Rozvi state of Changamire Dombo. But still I must go with unshod feet, to the hills we call Matobo. I am the chosen one, the message-bearer. So there will be pumpkin and also cucumber. I go to speak of rain. The delegate of drought, sent by the Karanga. When we talk of the Senegambia and it’s people, we tend to think only of the Mandinka, Wolof and Fulani. Here is something about the Jola and their ancient instrument of strings. He’s been practising when he can. Body of gourd and goatskin. For his verses of love brand new. Will it help the young man tonight? Prayers to Ata Emit the Creator. Peaceful makers of palm oil. Who came in after Mandinka. A songbook of melodies for her. While Ata Emit is painting sunset. To his dream of a lifetime partner.